Like chocolate and peanut butter, this is the joining of two simple ingredients where one plus one equals three. This is a drink that has kept me in a quandary for a long time over the debate between Rose’s lime juice in its current corn syrup state and products using real sugar and lime juice. As much as I wanted to find a way to have it all, I have thrown in the towel and accepted Rose’s (that is until I find a way to import the real stuff). This is another drink with no clear history, the name seems to have been coined in the 1920s after either a tool of the same name or a surgeon who pushed this as a measure of preventing scurvy on ships. 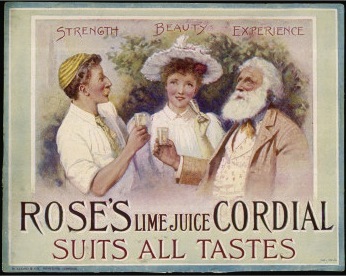 Seeing as how in 1747 it was discovered that lime juice could prevent scurvy and sailors were no doubt mixing lime and gin purely for its medicinal value by the nineteenth century, I am going with the scurvy story. Either way the cocktail has a long and glamorous history. In a mixing glass combine three and a half ounces of gin, use Plymouth’s here, and one and a half ounces of Rose’s lime juice, fill with ice and stir. Pour into a cocktail glass. This is one I will also build in an ice filled old fashioned glass and serve on the rocks. As you drink this, think of all the good things the vitamin C is doing for your body! Stir together both ingredients in a mixing glass with ice, pour into a cocktail glass.